We love this flavorful couscous. It's fruity and nutty and spicy at the same time. It's also made sweet from the sauce of yogurt and honey. It's a perfect combination of flavors and it's easy to make using instant couscous. If you have never cooked with Argan oil, you're in for a real treat. This is a delicate nutty flavored oil that you're going to want to use in your cooking on a regular basis. However, Argan oil isn't limited to culinary uses. This excerpt is from the NY Times Travel Section November 2007 "The real find, however, is argan oil, made from the nuts of the argan tree, which grows almost exclusively in this region. The oil, which is said to have restorative and age-defying effects, has become one of the latest miracle ingredients in the beauty industry. High in vitamin E and essential fatty acids, it is believed to help all sorts of skin conditions: dry skin, acne, psoriasis, eczema, wrinkles. Moroccans slather it on their skin, hair, nails and even their babies. They eat it, too — drizzling it over salads and couscous, or using it to make amlou, a tahini like spread of the oil, almonds and honey." This recipe was found in the New York Times. 1/2 cup plus 1 1/2 tablespoons honey. Place 1/2 tablespoon argan oil in skillet over medium heat. Add almonds, and cook, stirring, until almonds turn golden. Transfer to bowl. Add raisins, lemon zest and cinnamon to bowl, and mix well. Bring 1 1/2 cups water with pinch of salt and 1 1/2 tablespoons argan oil to boil in heavy saucepan. Stir in couscous, cover and remove from heat. Allow to sit 7 minutes to absorb liquid. Fluff with fork, and transfer to large bowl, mixing with fork or fingertips to break up any lumps. 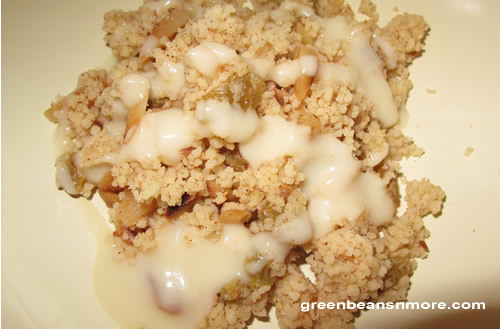 Reserve 1/3 cup of almond and raisin mixture and fold rest in with couscous. Beat 2/3 cup yogurt with 1/2 cup honey until smooth. Add lemon juice. Pour over couscous mixture, and fold in until grains are evenly moistened. Coat 5-to-6-cup bowl or mold with 1/2 tablespoon argan oil. Pack couscous mixture into mold, and smooth top. Set aside at room temperature until ready to serve. To serve, beat remaining yogurt with remaining honey and 1/2 tablespoon argan oil. Unmold couscous onto serving dish. Top with reserved raisins and almonds. Serve with yogurt and honey sauce on the side. Yield: 6 to 8 servings.